As promised, here is part II of our examination of some of the most partisan and most important presidential elections in the early history of the United States. Those historians that do not feel the election of 1800 was the nastiest in our history tend to believe that it was the election of 1828 that was in fact the worst of all. When it comes to political mudslinging, perhaps none could match that which was flung about in 1828, in a rematch between John Quincy Adams and Andrew Jackson. Quincy Adams won the election of 1824 over Jackson in what history has dubbed the “corrupt bargain,” a connotation that makes it no wonder that bitter feelings were held by Jackson towards Quincy Adams. Since the controversy of the 1824 election has much to do with the nastiness of 1828, it is important to take a look into both. As the presidency of James Monroe was winding down, a number of possible candidates began to enter the fold. When all was said and done, four men vied for the presidency and though they were all technically Jeffersonian Republicans due to the dissolution of the Federalists beginning during Jefferson’s tenure (it was as a result of this election that a major split in the party would occur with the party dissolving into the Jacksonian Democrats and the National Republicans, who would then become the Whigs and then the Republicans), their political beliefs tended to vary greatly. More so than anything else, each candidate was more reflective of the growing sectionalism within the country than their differing political beliefs, with each man representing a different area of the country and reflecting their different interests and beliefs. John Quincy Adams, the sitting Secretary of State, was from Massachusetts; William Harris Crawford, the sitting Secretary of Treasury, was from Georgia; Henry Clay, the Speaker of the House, was from Kentucky; and finally, Andrew Jackson, a U.S. Army General and sitting U.S. Senator, was from Tennessee (Secretary of War John C. Calhoun, from South Carolina, had also been in contention, but withdrew his candidacy as president after being promised the vice presidency in the case that either Quincy Adams or Jackson won). Although far more of a political novice than the other candidates, Andrew Jackson had more national fame and appeal than any of the other men due to his leadership during the Battle of New Orleans in the War of 1812, which greatly improved his chances. Once the election came around, Jackson in fact led in both the popular vote and the electoral vote; however, he, like the other men, lacked a majority in the Electoral College, and off to the House of Representatives we go again for each state’s delegation to cast one vote to decide the election. Those in the House had to choose from the candidates that finished with the top three votes, and those were Jackson, Quincy Adams, and Crawford, thus eliminating Henry Clay. Though Clay was out, his influence within the House chamber was considerable, and once he decided to throw his support behind Quincy Adams, so too did the rest of the caucus, giving Quincy Adams the presidency. Not long after, Quincy Adams appointed Henry Clay his Secretary of State, and almost immediately howls went up across the country, mostly from Jackson’s supporters, calling it a “corrupt bargain.” Not only did this permanently damage Clay’s reputation even though no evidence was proven to show this was anything other than a coincidence, but it embittered Jackson and led to a split in the Jeffersonian Republican Party into those who backed Jackson (Democratic-Republicans) and those who backed Quincy Adams (National Republicans). The stage was set for a nasty rematch. The controversial results of 1824 helped to create the conditions by which the election of 1828 became one of the nastiest and bitterest in our history. Again, newspaper articles and political cartoons took center stage in the attacks against each man. Jackson was slandered constantly for everything from his military record to his marriage. Jackson’s wife, Rachel, was technically a bigamist, as she had been estranged from her first husband, but still married, at the time she married Jackson. Supporters of Quincy Adams alleged that this meant Rachel Jackson was immoral and that she and her husband were both unfit for the office. When Rachel died a few weeks before Inauguration Day, Jackson blamed Quincy Adams and the attacks against his wife for causing her to have a nervous breakdown, which led to her death. Jackson was also portrayed as a bloodthirsty, Napoleonic dictator who would do away with democracy in favor of tyranny. 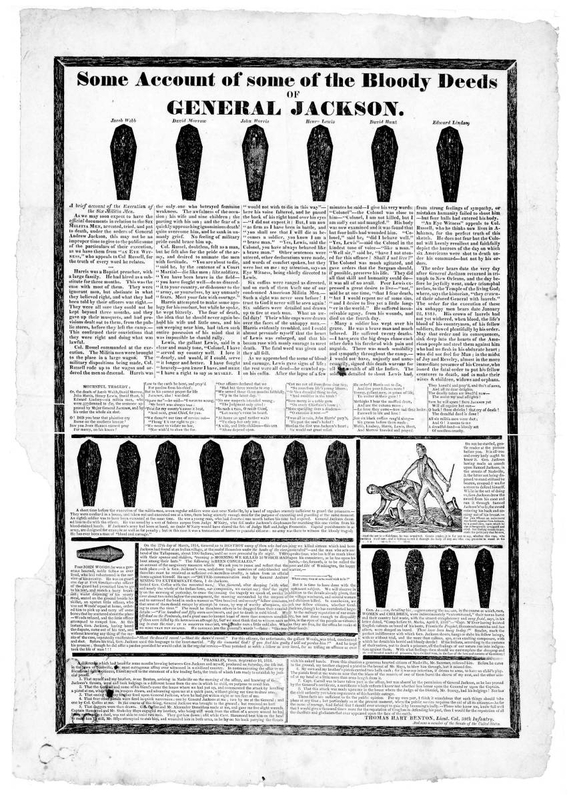 One of the most famous political cartoons and articles published against Jackson was the “coffin handbill,” depicting coffins and detailing accounts of “General Jackson’s bloody deeds.” The Quincy Adams camp often referred to him as a murderer for his execution of men in his unit that abandoned during the War of 1812. Quincy Adams got many of the same attacks his father did in 1796 and 1800, portraying him as an elitist and a corrupt aristocrat. A Jackson surrogate also accused Quincy Adams of trying to use a woman to seduce Czar Alexander to sway him for political purposes when Quincy Adams was the minister to Russia, a seemingly ridiculous accusation. In the end, however, none of the attacks against Jackson could diminish his national popularity or cover up the country’s displeasure with John Quincy Adams, and Jackson won in a landslide. The election of 1828 is pointed to by many as the first modern political campaign, but regardless of whether that is the case or not, it will certainly go down as one of the, if not the, nastiest campaign in our country’s history, thanks in large part to the seeds of bitterness sown in the election of 1824. It also carried with it great consequence for the political party system in our country, as the emergence of Jacksonian Democrats, who would later become the Democratic Party, brought with it the new Whig party that arose in opposition to Jackson and replaced the National Republicans. Eventually, the Whigs would become the Republican Party under Abraham Lincoln. While there have been a number of realignments within the two parties since 1860, the system we know today began to be formed during the early days of our country’s history, solidifying in the mid-19th century into our current two-party system. We can all think of more recent examples of elections that have felt particularly nasty and left us counting down the days until Election Day, and this year is certainly no different. Although we like to think partisanship and mudslinging during elections is a newer phenomenon, as you can see here, this has been an American pastime since the early days of our country. Politics is certainly not for the thin-skinned or the faint of heart, and with that I will of course remind you to get out there and exercise your constitutional right on November 6th because while we resent the constant barrage of ads each candidate throws at us every four years, the bottom line is that it is all done in the effort to get every citizen to do one thing: VOTE. Maisel, Sandy L. and Mark D. Brewer. Parties and Elections in America: The Electoral Process. (Lanham, MD: Rowman & Littlefield, 2012).